I’d imagine the number of local residents paying the slightest bit of attention to last night’s debate between Republican candidates for president hovered somewhere around, oh, zero. This is, after all, Bloomington, Indiana, the capital-in-exile of the former Soviet Union and geographical magnet for this holy land’s unscrubbed beatniks, bomb-throwers, abortionists, and other Democrats. So, The Pencil will do y’all a favor and point out the most eye-opening statement made by one of the fine and decorated statesmen and women who gathered to verbally spar in that other locus of undesirables, Washington, DC. Minnesota Congressbeing Michele Bachmann dug deep into her her pocket thesaurus and threw a sophisticated two-syllable pejorative at Texas Gov. Rick Perry. Y’know, the way every other nation on this spinning globe keeps the well-being of the land of Donald Trump, Lindsay Lohan, and Black Friday in the forefront of all its deliberations. Well, our plucky gal Michele found Perry’s logic rather lacking. Bachmann is a member of the House Intelligence Committee which, if nothing else, proves our elected representatives possess a sense of humor. She reminded Perry and the world that this country gains a lot of inside dope on the doings of the wild-eyed gun-toters who populate much of Pakistan’s desolate countryside. Our dough, Bachmann insisted, also insures that the borderline lunatics who run the place aren’t overthrown by certified lunatics. Kudos to Bachmann on grasping the fact that the syllables of a word needn’t be separated by consonants. Now, imagine how discouraged the cowboy governor is this morning to realize that Michele Bachmann — Michele Bachmann — considers him naive. The election, folks, is a mere 49 weeks away. I have a Twitter account, I’ll admit it. On the other hand, I haven’t touched it in more than a year. Twitter is the 140-character preserve of semi-literate pro athletes, pathologically self-involved Hollywood stars, and that portion of the populace that was born, sadly, with the condition known as anencephaly. 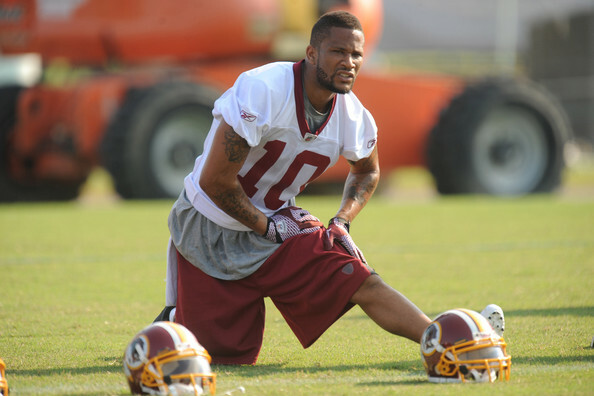 Take the recent Twit (screw “Tweet” — I’m going with Twit) from Washington Redskins pass catcher Jabar Gaffney. Anyway, Gaffney promptly advised the Twit-sender to, um, commit suicide. Yup. Gaffney thumbed these proto-words into his connection to the civilized world: “… I’m just proud I ain’t you get a life or kill urself.” The line is close enough to the human language known as English that I needn’t translate it for you. Naturally, the NFL and representatives of the sane population of America had apoplexy. Hell, if people can blame Judas Priest, whose song obliquely referred to the ultimate form of self-determination, for a couple of teens’ deaths in 1985, then Gaffney’s unmistakable advisement is fraught with peril. Sheesh. Now we know there are at least two people in this nation who don’t know ellipsis is indicated by three dots, not two. America is indeed going to hell. Cooler heads got to Gaffney and he apologized — the way many celebrities, politicians, and corporations apologize these days, which is not at all. Big time sports and the reprobates who perform in it and operate it are becoming less and less attractive by the week. The Loved One was incensed that First Lady Michele Obama caught the raspberry Sunday at a NASCAR race in Miami. 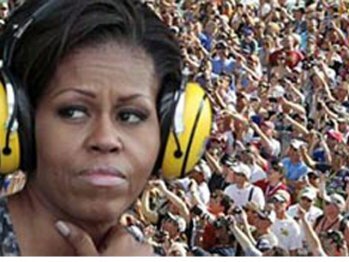 Many in the crowd of some 80,000 booed the president’s wife lustily when she was introduced prior to shouting “Start your engines” into a microphone. Aside from the fact that the speedway was filled with people who find deafeningly loud cars continually turning left at life threatening speeds entertaining, the race, it must be said, was held in Florida. That double-whammy indicates the crowd probably was lacking in thinkers who grasp the subtleties and nuances of today’s domestic and geopolitical debate. Who was the last Nobel Prize winner to hail from the Sunshine State? No matter, I actually tried to defend the crowd, which caused my lovely bride to eye me through narrowed lids. The Loved One shook her head almost imperceptibly. And, I have to admit, I’m not thrilled with my argument either. I haven’t much to say about Twitter except agreement on the types who in general use it. And of course I don’t give a damn about over paid athletes or sports in general. That being said keep the posts coming. I do pay attention to the Republican debates and shudder to think about the consequences of any one of them making it through. And now Ms. Bachmann gets to take the moral high road after Jimmy Fallon’s band ushered her on the show with a “sexist” song. We can’t win for losing. I beg all my liberal-minded friends to NOT sink to any juvenile level that makes these fools look righteous. Give ’em enough rope to hang themselves and they surely will – and do on a regular basis!